You can import references with a single click! To import references while researching with a web browser, install the Web Importer. 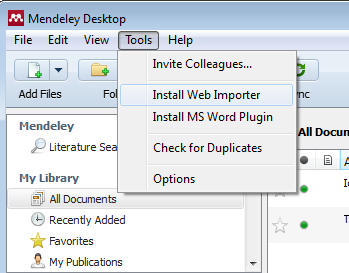 This can be done by hovering over "Tools" in the navigation bar of Mendeley Desktop and clicking on "Install Web Importer". Once Web Importer is installed, it will be available to click in your browser's Bookmark Toolbar. From there, adding references is easy as a single click when you have identified a worthy article. Click on "Save to Mendeley" and if an article is found, a pop-up will appear in your browser confirming the article to save. 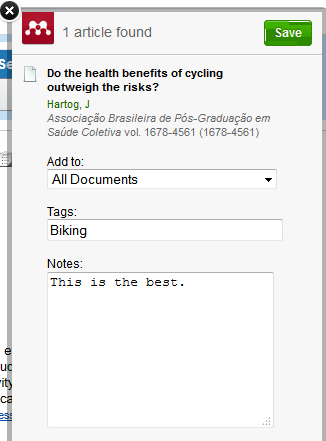 Mendeley allows you declare which folder if you have multiple projects going on, as well including Tags and Notes to enhance your library of research!